RecruitAbility attended the Bishop’s Stortford Means Business expo on Wednesday 18 October 2017. 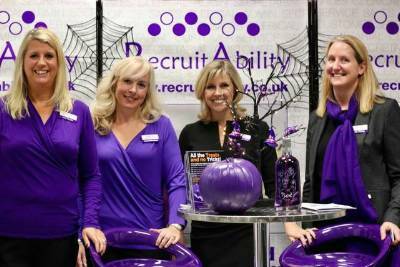 We took along a Halloween-themed stand with our “All the Treats and no Tricks” leaflets, which had useful recruitment advice for both candidates and clients. Click here to download. The lucky winner of our guess-the-weight-of-the-purple-pumpkin competition was Jo Hart of Mantle, who took home a beautiful bottle of Boe Violet Gin and some other goodies. We’d like to thank everyone who visited our stand and are already looking forward to the 2018 show.